There are many frightening inhabitants of Small World, but to survive you must Be Not Afraid...! This expansion for Small World includes a nasty lot of five new Races including Barbarians, Homunculi, Pixies, Pygmies, and greedy little Leprechauns. You'll also get five new Special Powers among which Catapult which allows you to leap over regions to conquer new lands. The Leprechauns have pots of gold. You put them into any of your regions at the end of your turn. If the gold is still there on your next turn you collect it for a VP. However, other players can conquer the region to take the VP. When you lose a Pygmy, you roll the die and get as many Pygmies back as shown on the die. You may still lose him… or get even more! You can get up to 14 of these guys. It works like other races with large numbers. They do not get to redeploy after conquering. These guys are interesting. When they get passed over you add 1 VP AND 1 race token to their banner. The player who finally picks them gets all those race tokens, but they do not have any power on their race card. You’ll need a good combo. There are 11 Pixies at your disposal , but only 1 Pixie can be put in a region. This is a good early game option, as you can spread fast… but weak. You can conquer a region 2 spaces away from one of your regions at 1 less token. Obviously, this is great for jumping defenses. When you occupy 4 or fewer regions, you earn +3 VP each turn. This is great for races without large numbers to begin with. Makes an opponent pay you 1 VP each time they conquer one of your regions. This would make Pixies more valuable, as they are easy to conquer. With Imperial you get 1 VP for every region you control above 3 at the end of your turn (5 regions equals 2 VP). Mercenary lets you spend a VP to conquer a region for 2 less tokens. This expansion does not have too many new twists. However, there is always something to covet, and Catapult is the New Power I crave. And, even though the rest of the races and powers are not fantastic, there are more total options (10) than the previous two expansions provided (5 and 7 respectively). I think this makes Be Not Afraid a good deal. This expansion is totally worth the money, and time. First of all, you receive 5 new races and 5 new tokens. And why does this help your playing?. Because by playing these will increase your chance of winning. You get the Homonculi. A mystical, alien-like creature in a slime tank. You receive and extra token when you pick them each time they are bypassed in the choosing your races phase. Then there are my personal favorite: Pixies. You get eleven of these when starting a game, although when it is redeployment time, you have to keep all of your Pixies off the board except the one that stays on the region. Pygmies, the scary looking tribe has the ability to roll a die each time you lose a Pygmie token. For each of the dots on the die displayed, you take that much Pygmie tokens. The ruthless, but surprisingly strange art race: The Barbarians. They are not that useful, they cannot redeploy their troops at the end of each turn. And lastly, the Leprechauns. After you conquer a region you may optionally chose to put a Pot of Gold to that region. After each turn, the region with the Pot of Gold gets one extra victory coin. However, if someone else conquers that region with the Pot of Gold, they receive it and may use it for their good. Now that are some interesting characters right? Moving on to the special powers. Barricade allows you to collect three bonus coins your barricade troops occupy four regions. Catapult, as its name states, may catapult you to a region that is one region away (but no adjacent) and conquer it for one token less, until the end of the turn, it is immune towards any enemy conquer attempt. Corrupt gives you one more coin after you conquer your own region, so there is basically no point of it, unless you look at it from the other perspective. Imperial. For each region in excess of 3, which your Imperial troops occupy at the end of the turn, collect one bonus coin. And finally, Mercenary. Each time you conquer a region, you may spend one victory coin to reduce the number of tokens you need to conquer it by 2. Overall, this expansion clearly expands the game, makes it more interesting to play, and raises your chance to win. Be Not Afraid is the largest of the race and power expansions to Small World, the other expansions are Grand Dames of Small World, Cursed! and the limited edition Royal Bonus. In the Small World: Be Not Afraid you will find 5 new races and 5 new special powers and a tray to store not only the tokens from this expansion but also from Grand Dames of Small World, Cursed! and Necromancer Island which is really nice and will just make your Small World life so much easier if you are out to get the expansions too! But now to the new races and powers! They dance around the bonfire in their tripe dance to please their gods to get the favour in the battle. But the gods are unpredictable and will either give you many new pygmies or leave you with nothing. These girls will plunder and loot huge areas of Small World while they are giving their axe a manicure but they have a hard time holding strategic important places. They sit at the end of the rainbow with a pot of gold but they has to be prepare to fight for it as the tales of the gold lures other races to try and get it. They look so cute but be afraid they swarm the regions of Small World as the eighth plague of ravaging grasshoppers. But a little bug spray will make them disappear. Homunculi: Get an extra token when they’re passed over in the choosing of races (6). Grown in an alchemist’s bottle from the ***** of a hanged man. The more battles there has been in Small World the more troops they get. Don’t touch me or I kill you! View the kingdom where the sun never sets. I give him an offer he can’t refuse. All in all Be Not Afraid is a wonderful expansion to Small World which will make the replay even more varied and the new races are both fun to play with and look at the same goes for the powers but mercenary seems a little underpowered but it will get you the place you really crave so it come by if it is together with a race who needs special regions to get extra VP. So be not afraid of getting this expansion! I own both Small World and Small World: Underground as well as all the Small World Expansions and this is the expansion to get. It does not change the play of the game much but it does add 5 new races and 5 new special abilities that add more variety to the game. It also ensures that there are always 6 races to choose from on the table at any given time, even when you are playing with 5 people and they each have 2 races in play. The races and abilities in this expansion are the most fun of any expansion, my personal favorites being the homunculi and Pixies. It also comes with a box that can hold the pieces to the Cursed! and Grand Dames expansions in addition to the Be Not Afraid pieces. The races and abilities found in this expansion are compatible with Underground as well as the original Small World. 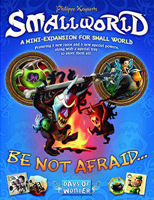 If you are a have fan of Small World you will enjoy Be Not Afraid and can find it for about $20. If you like Small World but are looking to improve it’s replayablity, this expansion may help with another few games but if you don’t LOVE Small World, expansions won’t make playing it more interesting. A great expansion to add more variety to your Small World games. Add a Review for "Small World: Be Not Afraid"